To live or sleep like a Viennese Hapsburg in modern times has become somewhat realistic thanks to some luxury hotel chains in Vienna, Austria. The Hapsburg Dynasty is known for it’s opulent and luxurious architecture all over Europe. Along with the architecture came the craving for the arts and music to fill their masterpieces thus creating one of the most important royal houses of Europe…in life and in death. 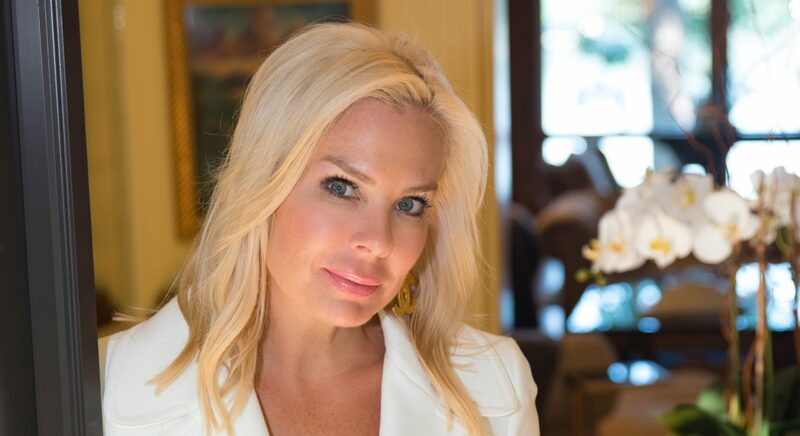 As the wife of an Austrian Diplomate, I have become to love the Austrian culture and Vienna rates as my #1 must see places in the world. With cooler weather, wine harvest season and Halloween around the corner I thought I would highlight some of the “not so obvious” things to do while in Vienna, Austria during the fall! Let’s start with your hotel stay. 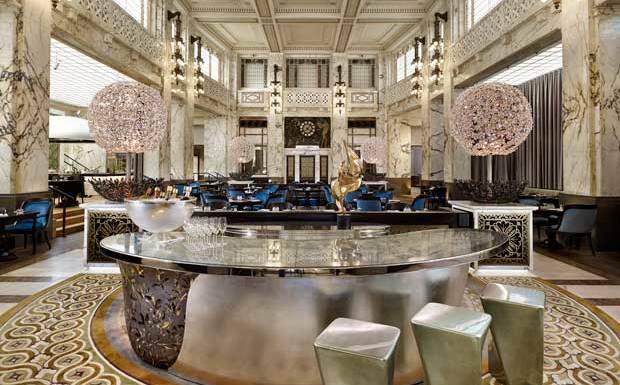 Whether you book the presidential suite or just take a stroll thru their grand lobbies…these hotels should certainly be on your tour schedule in between the museums, concerts and coffee shops! 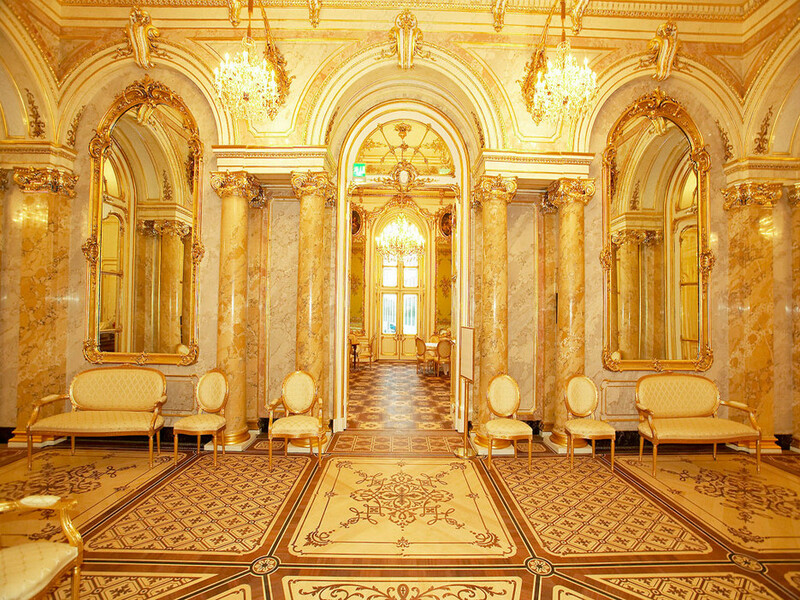 Golden opulence at the Palais Coburg. 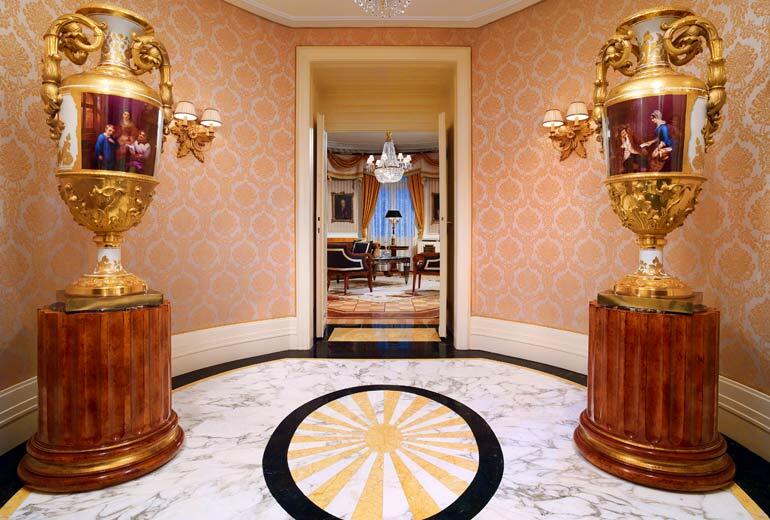 Sleep like a queen at Hotel Sacher in one of their stately appointed rooms. 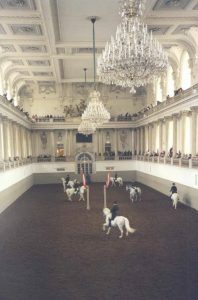 The Park Hyatt was the former headquarters of the Austrian Monarchy Bank. Prince of Wales Suite – Entrance at the Hotel Bristol. September is the time of the year for wine harvesting. There are many festivals and a perfect time to head into the neighboring hills of Grinzing and Klosterneuburg where you can sip Sturm, Zweigelt and Blauburger while enjoying a beautiful view of the city and the Danube. Wondering what Sturm is? It is a semi-fermented grape juice from the first grape harvest of the season. It’s low in alcohol and marks the official start of autumn! Typical Austrian brettl-jause (selection of cold cuts & cheeses on a wooden board) served with an Austrian white wine. With Halloween around the corner what better way to spend October than visiting the final resting place for the members of the Habsburg Empire known as The Imperial Crypt (German: Kaisergruft). 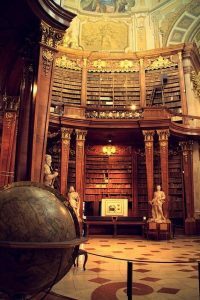 It is located beneath the Capuchin Church and monastery, which is located on Neuer Markt square (Inner Stadt), near the Hofburg Palace. 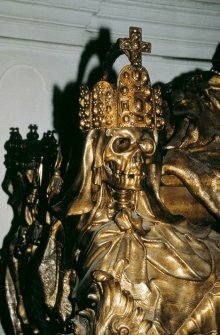 The bones of 145 Habsburg royalty, plus urns containing the hearts or cremated remains of four others, are here, including 12 emperors and 18 empresses. 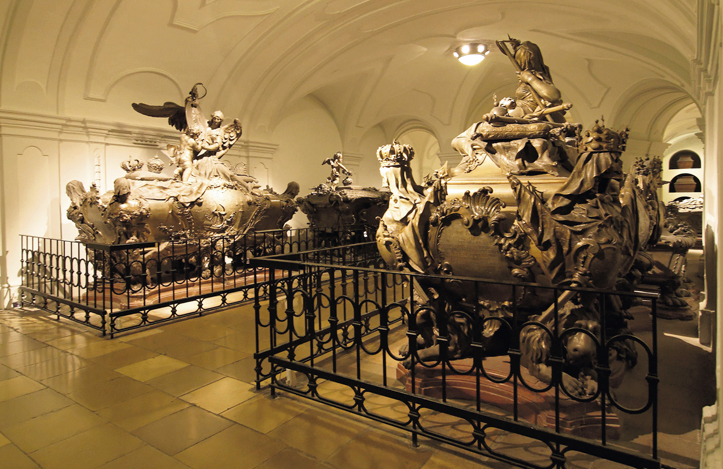 The metal caskets or sarcophagi styles range from simple to the über exuberant rococo. Detail on one of the many sarcophagi for the imperial family. Last but not least one must take a stroll or a horse drawn ride thru the Vienna Central Cemetery (Central Freidhof). It is so large that it hardly seems possible to be able to discover all of its intricacies and renowned burial sites. Be sure allow time for this must see spot. Fall is perfect when the temps start to chill the air. Austria’s most famous artist and musicians are buried here. 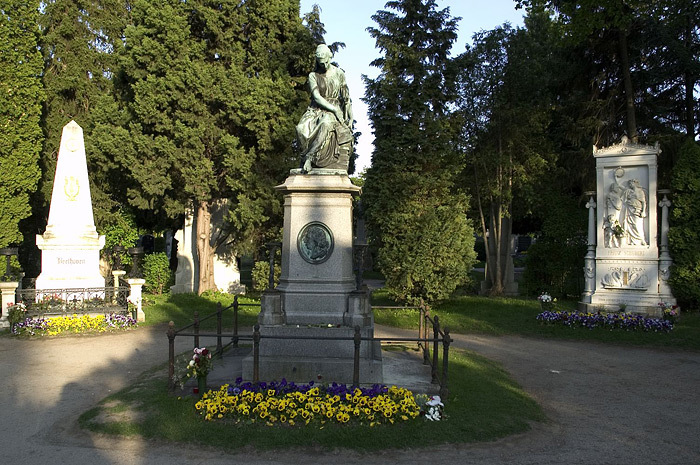 Beethovan and Schubert along with artist Gustav Klimt are buried at the central cemetery in Vienna. Mount Lussari (Italian: Monte Lussari, German: Luschariberg, Slovene: Svete Višarje) a pilgrimage church, where according to legend in 1360 a shepherd discovered a statue of Virgin Mary. 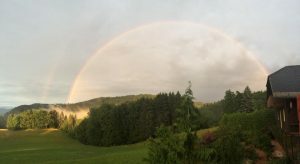 And I end with a double Rainbow….hope you enjoyed a peek into my Summer. Starbucks is the new accessory! name as long as others, but I consider it a personal signature! created the coffee culture that America was missing.” And thinking about it, he’s exactly right! 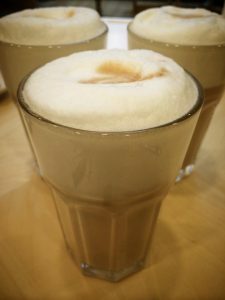 from one of their signature cups. a routine and, now that I think about it, a trendy accessory. * The gym – Nothing wakes you up more than a morning workout, but you need a little something on the way there to get you going! 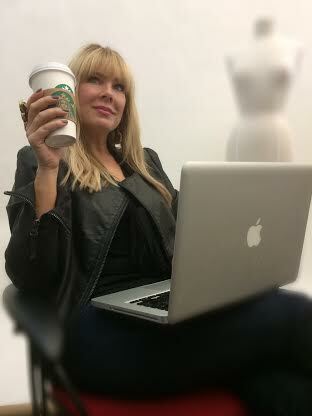 *The office – Everyone needs a little caffeine to keep them alert during their busy day. And since business settings are often “less is more,” this is the only ornament you’ll need. favorite blend, you won’t feel like you’re missing anything! It might be silly to think that something as simple as coffee can be a status symbol, but it is. that the company is now sponsoring my idol, Rachel Zoe! silently saying, “I’m here, I’m in charge, and I’m stylish.” What woman doesn’t want that?